When I think of what I want my home to be, I think of a place of safety. A few days ago I asked the question, what is your home safe from? What is it safe FOR? I want my home to be a place where others find freedom to be who they are. I can clearly remember several years ago when I was trying to tell someone about a poem I had written. This person told me, “Melissa, you are just too deep!” I was so hurt by that statement. As I think about my own home, I want it to be a safe place – a place where you can never be too much. If you are a deep philosopher – you are safe here. If you are a funny entertainer – you are safe here. Tears are safe here. Laughter is safe here. Silliness is safe here. Silence is safe here. In my home, I want you to have the freedom to be. 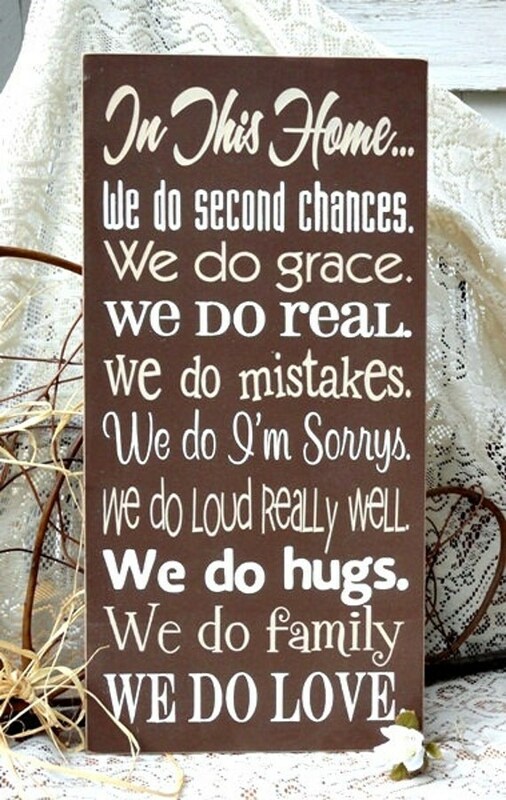 My husband & I are still working on our “we do’s”, but I love the idea of actually having a way to communicate to everyone (visitors included) what our home stands for & how we keep it safe. What about you? Is there a way you communicate your home values to others? What are some of the things you “do” in your home? We have a painting in our home that says, “It is well…with my soul.” This statement expresses what I hope is the experience for souls as they come through our home…that it would be well with their souls. My hope is that my home and family create a space for souls to find rest and peace. Even today, though, I am reminded that I must create a place for my family’s souls to be at peace so that we as a family can offer that to others. It would be counterproductive to focus on having others souls be minsitered to in my home while ignoring the three most important souls I’ve been entrusted with. I must remember to make our home a place where it can be well with their souls first and then as an outcome of that family rest, others can find peace here, too. I truly enjoyed this post today. You really hit right home. I am one who loves to be myself but is afraid of what other people think- but over the years i have come to just step out and enjoy being me, its still alot of work, but i want my home to be the same, where we are who we are…and love and accept each other as we are and love each others differences. I love this post. I want my home to be the same. I want my daughter growing up confident of being who she is and who God created her to be! Thank you for posting this. This is something i will strive to do in my home!